After several years of planning, the National Malaria Control Program [Programme National de Lutte Contre le Paludisme (PNLP)] in Mali became a separate Directorate within the Ministry of Health. With this change, the PNLP became a highly visible program with increased funding and ambitious objectives. 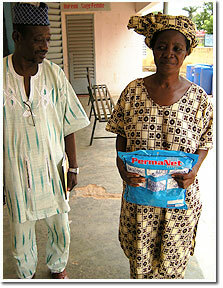 The number of PNLP staff devoted to malaria more than tripled, essentially resulting in a new team. At least 32 of the projected 42 positions in the new Directorate were filled by September 2008. And to facilitate better functioning of this new PNLP team, USAID Mali requested that Jhpiego as lead of the ACCESS Program (Access to Clinical and Community Maternal, Neonatal and Women’s Health Services) to conduct a team-building workshop with all cadres of PNLP staff. To develop an effective team-building workshop, the ACCESS Program sent consultants from Jhpiego to Mali to undertake a situation analysis, reviewing documents such as the National Malaria Strategy and the government orders that created the new Directorate. The consultants also conducted 18 in-depth interviews with national partners including other government units, nongovernmental organizations, donor agencies and implementing partners at the regional and front-line health facility levels. These partners provided valuable insight on the implementation, management and communication successes and challenges of the PNLP. Incorporating results from their situational analysis, Jhpiego’s consultants worked with a group of PNLP staff to plan a three-day team-building workshop that was oriented to problem solving. All available PNLP staff took part in the team-building workshop, which began by examining the roles, responsibilities and job descriptions of team members. Workshop attendees then developed a vision and mission statement for the PNLP. Challenges identified during the situation analysis were shared, and ultimately became the foundation for small-group, problem-solving activities. In plenary, attendees presented solutions for discussion; these solutions later formed the basis of an action plan. One of the challenges revealed by the situation analysis was the need for improving communication internally and with partners. To address this challenge, the PNLP included the development of a regular newsletter in their action plan. Another team-building exercise ensued, consisting of small groups writing [draft] stories about their work for the first edition of this newsletter. Workshop attendees also developed a set of team performance standards that included 38 criteria for measuring their progress. These standards focused on internal and external communication, coordination and leadership. In plenary, participants discussed each performance standard and criterion, and agreed that only 12 had been achieved. Overall, the team appeared to be strong in internal communication, coordination and leadership. However, to implement the National Malaria Strategy effectively, the PNLP team determined that they need to improve their external relationships and roles. The PNLP team plans to revisit its performance standards soon. As they count their progress toward achieving these standards, the PNLP team can also work more effectively to count malaria out in Mali.